Apache Lake is a popular recreation destination within the Tonto National Forest, which is the authority that manages the facilities located at the lake. 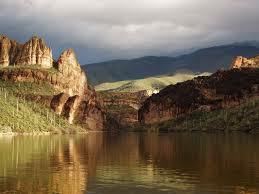 The lake is located along the Apache Trail and a number of other hiking trails can be found in the area. Many species of fish can be found in the lake, including largemouth, smallmouth and yellow bass, crappie, sunfish, both channel and flathead catfish, walleye and carp.